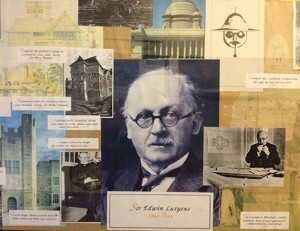 Tilford Institute was one of the architect Sir Edwin Lutyens’ earliest commissions, having been built in 1893 when he was just 24. Its brick and half-timbered construction reflects the design parameters that later became his permanent trademark of adapting traditional architectural styles to the requirements of his particular time. The Institute faces onto Tilford Green and was erected in memory of Charles Archibald Anderson of Waverley Abbey near Farnham. The old chapel site to south-east of village green bought by the Trustees and original trusts declared. Land exchanged for present site and the Institute was built. Funds were provided by the Anderson family of Waverley Abbey, it probably cost around £1000. The Tilford Institute opens as a club for entertainment, with a paid membership, but also available for private hire. Tennis, Football and Cricket clubs were affiliated to the Institute and a bowling green was maintained. Other users included a Mens Club and Women’s Social Club. Electric lights were installed – £41 was raised locally. The porch was enclosed to try to prevent draughts. The Bowling green turf was used for a new Tennis court. Boxing gloves and a gramophone were purchased. The Institute had to close for several months to make safety improvements required by the County Council. A motion was passed to change the name from the “Tilford Institute” to the “Tilford Village Hall”. Despite this the old name has remained in common use to the present day! Last Tennis tournament; the tennis court is now the car park. During the war the Institute was used by the Red Cross, Air raid wardens and Home guard, but local dances went on! The hall started to be used for school meals. Gas was installed for cooking and heating. After a local appeal the false ceiling was erected, globe lights were installed, and the gas heaters replaced. Plans and fund raising began for major improvements. The Institute was registered as a Charity. Current rules laid down by The Charity Commissioners. Extension added to give changing rooms (doubling as a committee room), and new lavatories installed in porch. Committee room used as overflow class by Infant School. Institute listed as a building of architectural interest. Wooden doors across stage front removed. Emergency lighting installed to meet safety requirements. Institute no longer used for School meals. Fund raising enabled installation of new gas heating. Centenary Appeal launched at village fête. Centenary Wing opened and Lutyens Hall renovated.